I’m owned by a cat. And yes, I love dogs. Lately, I have been writing a bit about Pit Bulls. Personally, I think they are adorable. My neighbor has one, and he is the sweetest boy. Even my 10-year-old son, who can be intimidated by bigger breeds, loves this dog. A friend of mine wanted to adopt one, but didn’t because she couldn’t afford the home owner’s insurance that she would be charged if she gets a Pit Bull. I’m focusing on Pit Bulls because they need ambassadors since they are often discriminated against. A Pit Bull owner named Melissa has experienced different forms of discrimination against her dog, Sam. Whenever she’s out with Sam, people shrink back and ask her if he’s a Pit Bull. Melissa wasn’t sure exactly of his makeup, as Sam is a rescue dog. So she decided to get a DNA test for Sam; she found out that he is 45 percent American Staffordshire Terrier, 45 percent Basset Hound, and 10 percent Chesapeake Bay Retriever. Having people walk away or cross the street when they see you coming is one thing. Recently though the negativity got worse. She was in the park with her dog, Sam. Someone came up to her and said, “I don’t want my dog playing with a Pit Bull. Get that dog out of here.” Other people joined in, saying they didn’t ever want to see Sam in the park again. Melissa took Sam home and then burst into tears. I’m appalled and disgusted by this and by dog discrimination laws that are still being passed in cities around the country. The same day I heard about this story, I also learned about another Pit Bull. This one works as a therapy dog. It’s hard not to believe in fate when you hear Cody’s story—a deformed puppy that was abandoned at a shelter and is now a certified therapy dog. 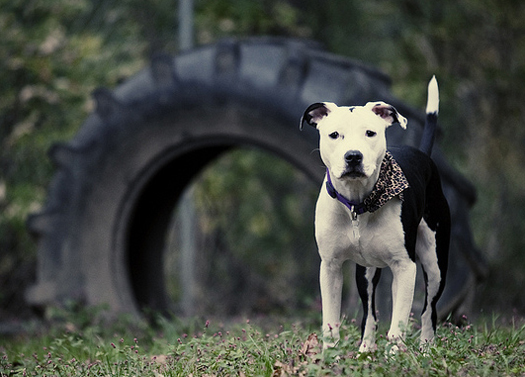 Due to prejudice, even healthy Pit Bulls can have a hard time finding a home. But Cody landed in a shelter with a deformed foot, and his chances weren’t looking good until San Diego-based Even Chance Pit Bull Advocacy stopped by the shelter to see another dog and noticed the limping puppy. Cody illustrates just what is possible when prejudice is set aside. 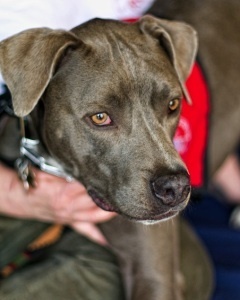 At age 1, Cody became the first Pit Bull to be certified as a therapy dog through New Leash On Life’s Lend a Paw program in Los Angeles. “During the wheelchair client test, he gently put his paws on the lap and kissed the client who was thrilled,” describes Sulier. And while Cody still has a slight limp due to missing bones and muscles in his right foreleg, he doesn’t let it slow him down. Sulier believes it will also help physically challenged children relate to him. Cody illustrates just what is possible when prejudice is set aside. Once discarded as damaged goods, he is now changing lives as a therapy dog. Whether a dog is 100 percent Pit Bull or mixed, it doesn’t matter to me. What does matter is the way it is treated.